Jordan Pruiksma is an impressive young trainer, with a variety of equine experiences from Racing to Polo, and a great love for OTTBs. You can feel the love and respect she has for these amazing horses – and for all those she has learned from – in her blog posts here: http://ontrackwiththeofftracktb.blogspot.com/2016/05/weartheblue-story-behind-my-racing.html. 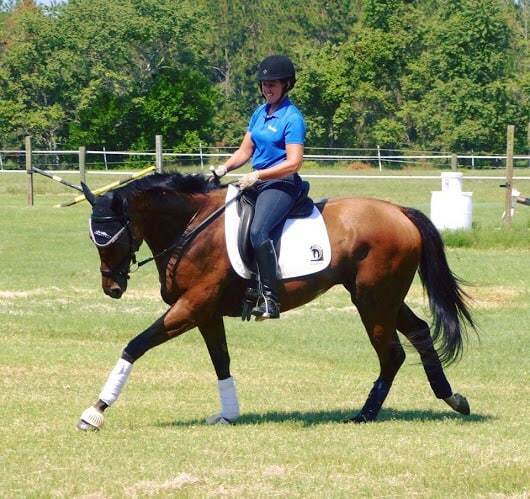 After competing in the 2015 RRP Thoroughbred Makeover Challenge and helping her OTTB partner, Fullback, find his forever home, Jordan knew that she needed a new project. Through her former employers at the Darley Stud and Godolphin Racing Stables, she acquired Coordinate after he ran ten successful turf races. “I received Coordinate from Saratoga in February of this year but wasn’t able to begin working with him until March,” recalled Jordan. After spending a few weeks helping Coordinate gain some weight and build the muscle necessary to begin training, the pair got right to work. “He has always been willing and quiet and easy going but he needed a lot of work with fitness,” explained Jordan. “I used to have to spend a lot of time warming him up before we started work, but now that we have the Accuhorsemat, he comes right through his topline and as a bonus he reacted really well to it from the beginning. He went right to “zen” mode and I notice a huge difference when I ride him,” she continued. Recently Jordan and Coordinate competed in a local dressage show in South Carolina and were the high placing thoroughbred in the competition, placing second over all in Training Level Test II! We can’t wait to see what the pair achieves next on their road to the Makeover Challenge.